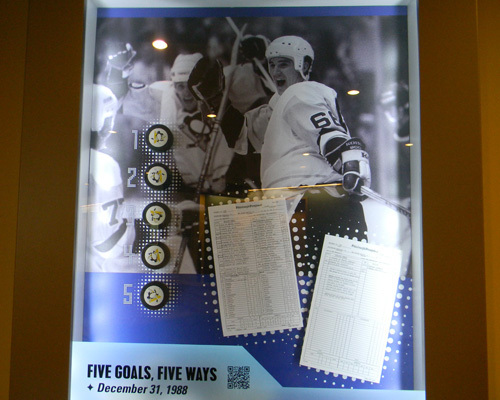 Throughout the summer, www.PittsburghPenguins.com will periodically present a PNC Wealth Management "Legendary Moment" from the PNC Legends Level Suites at CONSOL Energy Center. Each display features an incredible moment from Penguins history, complete with a description, photos and actual keepsakes from the event. 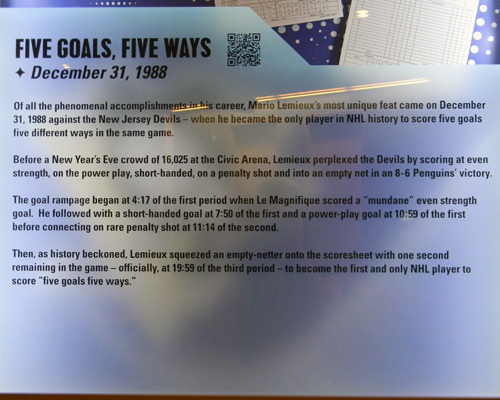 Of all the phenomenal accomplishments in his career, Mario Lemieux’s most unique feat came on December 31, 1988 against the New Jersey Devils – when he became the only player in NHL history to score five goals five different ways in the same game. 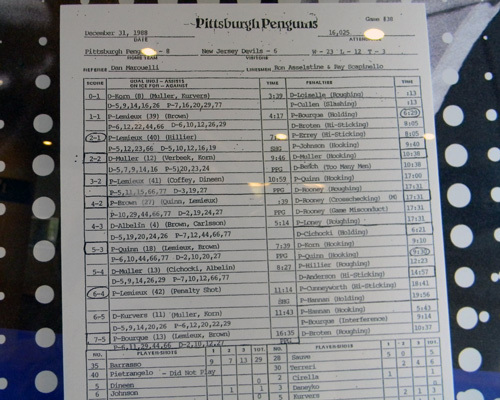 Before a New Year’s Eve crowd of 16,025 at the Civic Arena, Lemieux perplexed the Devils by scoring at even strength, on the power play, shorthanded, on a penalty shot and into an empty net in an 8-6 Penguins victory. 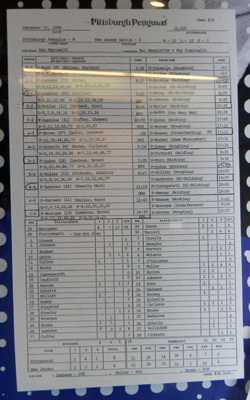 The goal rampage began at 4:17 of the first period when Le Magnifique scored a “mundane” even strength goal. He followed with a shorthanded goal at 7:50 of the first and a power-play goal at 10:59 of the first before connecting on a rare penalty shot at 11:14 of the second.